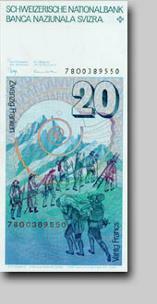 Since 1907, when the first series of Swiss banknotes was printed, eight series have been printed. 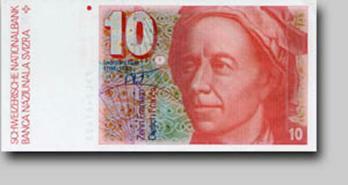 The (8th) (1995+) series of banknotes is current. The previous series (6th, 1976) has been recalled and will lose any value on 1 May 2020. The (7th) series was printed, but is kept as a "reserve series", ready to be used if, for example, wide counterfeiting of the current series suddenly happened. For security reasons, the Swiss National Bank has not published any description or picture of this series, apart from very small extracts. In February 2005, a competition was launched for the design of the 9th series planned to be released around 2016 on the theme ‘Switzerland open to the world’. Symbols: Al = aluminium, Cu = copper, Ni = nickel, Sn = tin, Zn = zinc; denotes proportion of alloys in %. Since autumn 2012, the Swiss National Bank (SNB) has been aware of the fact that there is a small number of Swiss 1000-franc banknotes in circulation which were not issued by the SNB. Investigations have revealed that around 1,800 notes, with a value of CHF 1.8 million, were abstracted during the production process at Orell Füssli. The banknotes in question have not been through all stages of production. The matter is currently being investigated by Switzerland’s Office of the Attorney General. In agreement with the Office of the Attorney General and out of consideration for these investigations, this information was not publicised before now (cf. also Orell Füssli press release). The banknotes can be identified by the fact that they have no serial number or that the serial number has been subsequently printed onto the notes. It is also possible that the perforated number (microperf®) is missing or has been tampered with. The invalid banknotes are difficult to recognise at first glance. Anyone suspecting that they may be in possession of an invalid 1000-franc note can take their notes to a bank and request that they be examined to establish its authenticity. Alternatively, the banknotes can be handed in for checking at the Counterfeit Currency Central Office (Federal Office of Police, Nussbaumstrasse 29, 3003 Berne), the Swiss National Bank (Börsenstrasse 15, Zurich or Bundesplatz 1, Berne) or a police station. Those in possession of such banknotes will be reimbursed the nominal value. Orell Füssli will cover the cost of the damages; the corresponding refund payments will be carried out via the SNB. 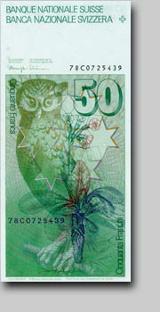 Information on the various security features of Swiss banknotes is available on the Swiss National Bank’s website under Banknotes and coins. 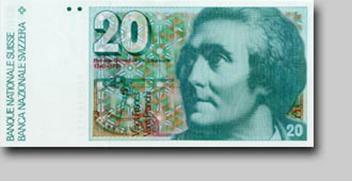 New series franc notes started in April 2016 with 50 CHF note. 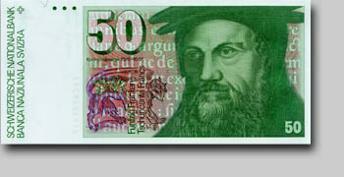 The other denomination will be introduced gradually over next years. 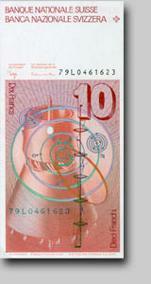 All notes from the eighth series (1995)will remain valid until further notice.